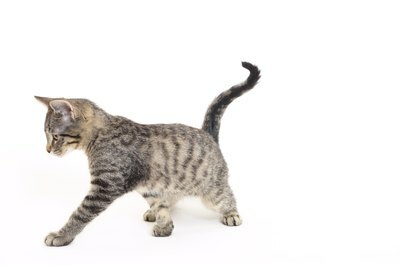 Can Cats Get Parkinson's Disease? If your cat is exhibiting symptoms of Parkinson's, speak to your vet. Some cat illnesses present with symptoms that are similar to those of human diseases, including Parkinson's disease. Though the presentation may mimic human Parkinson's, the causes and treatments for "Kitty Parkinson's" are different than those of Parkinson's in humans. Parkinson's disease is an incurable progressive neurological disorder in humans that causes tremors, problems with swallowing, movement, eyesight, stiff, achy or rigid muscles, spasms, confusion, excessive lethargy, drooling, depression, dementia, memory loss, fainting and other nerve-related symptoms. Caused by the destruction of dopamine-producing cells, the illness is often hereditary and occurs in adults over the age of 50. In rare cases, the disease is found in younger adults or even children. When any combination of Parkinson-like symptoms occur in an individual, the condition is considered "parkinsonian," with or without a diagnosis of Parkinson's disease. A cat can exhibit "parkinsonian" symptoms, including small-to-pronounced tremors, front or back leg weakness, an altered or sluggish gait, rhythmic tics or twitches of the extremities, ears, eyes, tongue or face, frequenting falling or a lack of coordination. Though the symptoms may be similar to those in humans with Parkinson's disease, the diagnosis and treatment will differ from cat-to-cat, and the disease is not Parkinson's. Unlike human Parkinson's disease, Parkinsonian symptoms in cats can have many causes, and your veterinarian will determine which treatment will be most effective. Possible causes may include several types of degenerative neurological disorders, encephalitis (swelling of the brain), injury, a reaction to prescription drugs, food or vitamin toxicity or sensitivity, spinal, brain or nerve tumors, lead or mercury poisoning, vertebra irregularities, metabolic disorders, including kidney or liver failure, atrophy, pain or weakness of one or more limbs due to injury or illness. The veterinarian may run a series of tests to determine possible causes for your cat's parkinsonian symptoms. These tests may include: a complete blood count (CBC), urinalysis, a myelogram (dye-study of the spinal column), a CT scan or MRI, a spinal tap or cerebralspinal fluid check (CSF), X-rays, or an electromyelography (EMG) to check for muscular problems. Treatment for your cat's condition will be determined based upon the findings of these tests and may include drugs, palliative care at home, avoidance of toxins, a change in diet, kitty acupuncture or acupressure, massage or other traditional or holistic remedies. "What Does ""Seal Point Cat"" Mean?" Can Neosporin or Vaseline Be Used on Kittens? Is Lawn Fertilizer With Weed Control Poisonous to Dogs? Do Dogs & Cats Have Deciduous Molars?